Good Morning. My good friend Christine has written a wonderful tutorial. Halloween themed Mug Rugs. Super cute and super easy. 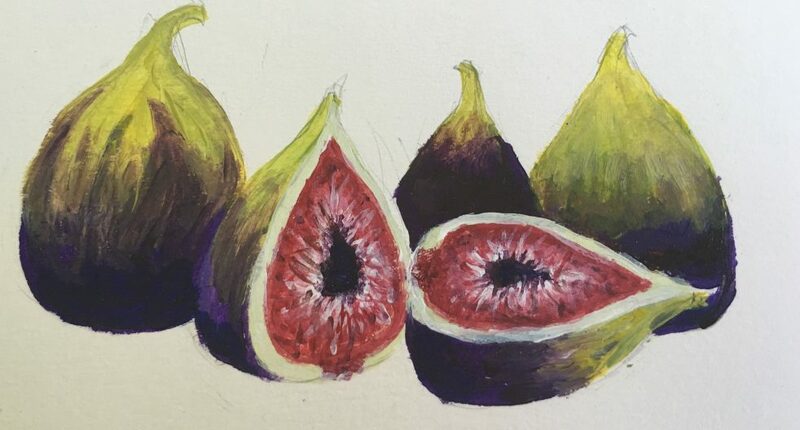 Hello followers of The Fig Farm! My name is Christine and I blog over at Stitch ALL The Things. I began my stitchy journey in May of 2012 when I finished my first quilt. It was only supposed to be a practice quilt before I attempted to make a graduation quilt for my daughter. I was hooked from the moment I started sewing! Since then I’ve learned to cross stitch, and make hand bags and wallets. My first love is quilting, but if you read my blog you’ll find I often switch back and forth between that and bag making. I’ve been friends with Theresa since around 2007 (I think?!). We met on an online forum and then met in real life a few years later. She is a wonderful friend and helped me through a very difficult time and transition in my life. She’s also a blast to be around! I was thrilled when she asked if I’d come up with a simple guest tutorial to share on her blog. I needed to make some mug rugs for my home, and decided that would make a perfect project to share. I chose to make these Halloween-themed since October is around the corner and Halloween is my favorite Holiday of the year! This is a simple project that will take anywhere between 1 to 3 hours to finish, depending on your skill level. The hardest part is going to be choosing your fabrics! When cutting your fabric out for your Mug Rug, you may choose to “fussy cut” out certain parts of the print. To do this I used my 4.5″ square acrylic ruler. It helps me to see if the area I want to cut out will fit. Please note that 1/4″ of the perimeter will be covered by your binding. You don’t have to have a separate 4.5″ ruler for this, as you can use a larger acrylic ruler and still see the 4.5″ area. If you don’t have a rotary cutter or acrylic rulers, never fear! Make a template old school style by grabbing a piece of paper, a ruler, and a pen or pencil. Measure and draw out a 4.5″ square and a 6″ square, cut them out with scissors and use those as your templates to draw and cut out squares from your fabrics with scissors. After you’ve cut your backing, main fabric, and batting pieces, it’s time to baste them together. Center the batting onto your backing. You should have a 3/4″ border of backing fabric all the way around. Place your main print on top of the batting and pin the pieces together making sure all fabrics lay flat and do not shift. Now for the fun part… quilting! You can make your quilting lines however you like. I chose a crosshatch pattern. You can quilt vertically, horizontally, diagonally, with lots of stitching lines or only a few lines. You can quilt shapes, letters, or whatever else suits your fancy. Echo a design on your fabric if you like. The point is, we need to make sure to stitch these three parts together so they don’t shift around as you use them. I typically use a walking or “even feed” foot, but these little fellers don’t require that. Your normal foot will work fine. Set your stitch length to three, and lets get started! Pick your starting point (the following pictures and instructions will show the quilting path for the crosshatch quilt pattern), lift up your sewing machine foot and place the starting point under your needle. Make sure you have long thread tails and begin by pulling the bottom thread to the top. Do this by holding the top thread tail and use the hand wheel to bring your needle down, and up again. Gently pull the top thread tail and your bottom tail will pop up. Use a pin to grab the bottom tail loop and pull it through. Put both thread tails under your foot trailing out towards the back of the machine. Use the hand wheel to put your needle back in the same starting position where your bottom tail is and begin quilting. Do NOT backstitch! I began stitching from one corner to the corner diagonal from it. Once I got to the corner I kept my needle down, lifted my presser foot, and pivoted the mug rug to sew up the edge of the 4.5″ main fabric about an inch. I repeated the pivot process, and using the first stitching line as a guide I eyeballed the space between my foot and the stitching line and stitched back up the mug rug, parallel to the first line. Don’t worry if your lines go a little off. A little “organic” quilting always looks great in my book! Continue to sew and pivot when you reach an edge. You can see my starting point at the green dot and fancy arrow, and follow the solid arrows to see my sewn path. The hollow arrows show the path to continue stitching, ending at the red dot. Once I reached the red dot, I pivoted the mug rug so that the diagonal corner was directly opposite and repeated the stitching path to achieve the cross hatch pattern. Once you are finished stitching, pull up your bottom thread to the top by gently tugging on your top thread until the bottom thread loop pops up. Pull loop through to the top. You’ll notice that I wasn’t done stitching the crosshatch design in the next couple of images, but I didn’t figure that out until a few steps later. I fixed my error as soon as I noticed it, and thankfully that was before I stitched the binding down! Knot your starting and ending threads and clip off close to the knot. You’ll be covering these knots up shortly! Press your mug rug with a hot iron, no steam. Fold each backing side up to the raw edge of the main fabric and batting and press. Open up only the top and bottom edges, keeping the side edges folded. Fold the side edges once more and press. Pin side edges down. Fold each corner of the bottom edge as shown. Leave a tiny gap between the folded edge and the main fabric/batting. This will help your corners come together nicely. After you’ve folded your corners, fold the bottom raw edge up to the main fabric/batting. You’ll already have a crease here from your initial pressing. Fold up once more and pin in place, making sure your corners match and look neat. Pin in place. Repeat the process with the top edge. Use a coordinating thread to stitch down your binding. Begin halfway down one side, and place your needle as close to the inside edge as possible. About a 1/16th of an inch seam allowance. Be sure to backstitch here! Stitch along the edge and, once you reach a corner, pivot with your needle down. Be sure to catch the the fold on the corners when you pivot. Backstitch once you reach your starting point. Clip your threads close to the stitching and press once more. Voilà! You are done! If you stuck around all the way until the end of the tutorial, thanks for following along! This is an easy tutorial to resize. Just remember that whatever size you want your mug rug to be, use the same size for the backing fabric, and add 1.5″ to that number. You will always need to end up with 3/4″ of backing fabric on each side of your main print/batting to make your binding with. For example, if you want a 5″ x 8″ rectangular mug rug, your main print and batting will be cut at 5″ x 8″, and your backing will be cut at 6.5″ x 9.5″. Happy stitching! Nice tutorial, Christine! Thanks, Theresa for hosting it! You’re welcome!! Christine makes quilting look easy. Thanks, Sharon! I appreciate you stopping by to check it out! Thanks for the reminder on how to do this. I’d forgotten this method. I have mug rugs to make for my quilt guild, and didn’t want to bind them the other way. It’s such a great way to make these quickly. Glad I was able to help you remember this way of making them! Great tutorial! Very detailed and lots of helpful pics! I’m going to have to make some of these! Thanks, Sarah!! I am going to make some Christmas ones this week!